I heard on the news the other day that Amazon was launching an app for enlisting “citizen” drivers to deliver their wares in Seattle. This is an inventive approach for a large corporation seeking to improve the scope of their business. It points to the rising trend of companies functioning as “network orchestrators,” such as Facebook, LinkedIn, Airbnb, Alibaba and Uber, who create a network of peers in which the participants interact and share in the value creation of the business. Oddly enough, this reminds me of the model that the Maryland Department of Natural Resources is engaging for its Marylanders Grow Oysters Program, which launched in 2008. In 2008, waterfront property owners along the Tred Avon River began growing oysters in about 850 wire mesh cages suspended off of their docks. These citizen growers signed up free through MGO and dedicated their docks as viable oyster growing habitat. Now in its eighth growing season, this network of likeminded peers has grown tremendously. 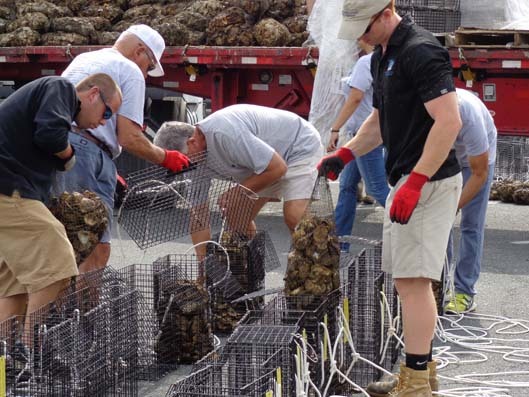 One of the partner organizations for MGO is the Oyster Recovery Partnership which teams up with Horn Point Laboratory to provide the substrate for growing oysters: oyster spat-on-shell. This year, ORP is delivering approximately 1,400 bushels of live oyster spat to fill over 7,500 cages in 32 tributaries around Maryland. In order to get the oyster spat and cages to dock owners, local MGO coordinators must engage volunteers to orchestrate the delivery of all these materials. 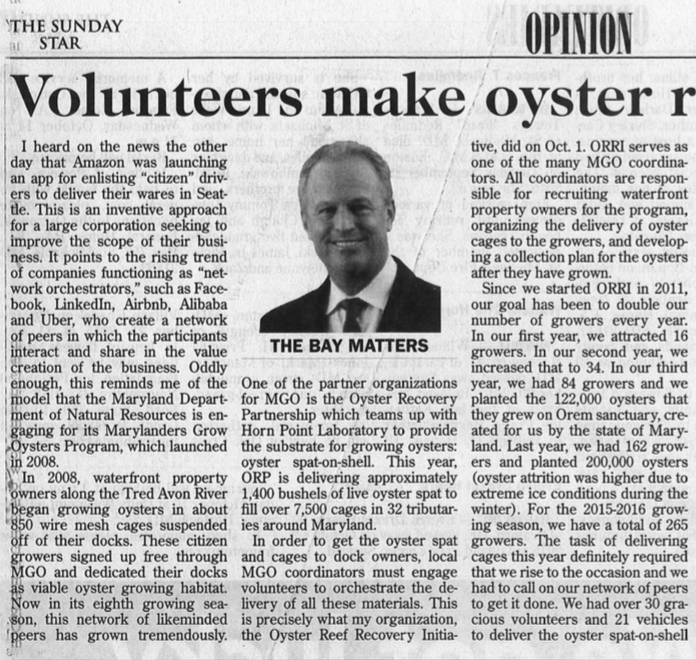 This is precisely what my organization, the Oyster Reef Recovery Initiative, did on Oct. 1. ORRI serves as one of the many MGO coordinators. All coordinators are responsible for recruiting waterfront property owners for the program, organizing the delivery of oyster cages to the growers, and developing a collection plan for the oysters after they have grown. Since we started ORRI in 2011, our goal has been to double our number of growers every year. In our first year, we attracted 16 growers. In our second year, we increased that to 34. In our third year, we had 84 growers and we planted the 122,000 oysters that they grew on Orem sanctuary, created for us by the state of Maryland. Last year, we had 162 growers and planted 200,000 oysters (oyster attrition was higher due to extreme ice conditions during the winter). For the 2015-2016 growing season, we have a total of 265 growers. The task of delivering cages this year definitely required that we rise to the occasion and we had to call on our network of peers to get it done. We had over 30 gracious volunteers and 21 vehicles to deliver the oyster spat-on-shell and cages to growers. After about seven months, we will need to pick all of the oysters up and the DNR will appropriate those oysters to state-protected sanctuaries. As you can see, the wonderful idea to rehabilitate the Bay by re-establishing lost oyster reefs is accomplished through “network orchestrators.” MGO is the parent organization, local coordinators facilitate dock owners in program participation, and volunteers and citizens perform the actual work. Unlike the internet giants I mentioned earlier, the only compensation that is involved is the reward of stewardship and contributing to the restoration of the national landmark that we call home. I would like to take this opportunity to thank all of the volunteers, watermen, and coordinators, across the state, that make the MGO program such a success. And of course, thank you to the growers who serve as guardians to these baby oysters while they grow to maturity. Thank you for keeping up with cage maintenance throughout the growing season (every week or two, growers must “dunk their cages like a tea bag” to prevent fouling growth that might smother and hinder oyster growth). And, of course, thank you to our “network orchestrators” higher up in organizations like the DNR and ORP. I am proud to be a part of such a successful program and I hope to see it grow by leaps and bounds in the years to come. • Oct. 13: VoiCeS (Volunteers as Chesapeake Stewards) a six-week course for adult volunteers who want to learn more about the Bay. Tuesdays, 6 to 9 p.m. Eastern Shore Conservation Center, Easton. • Oct. 24: Discovery Paddle, see a prime example of a healthy Eastern Shore Creek. For all skill levels. End of Southest Creek Road, Church Hill. 10 a.m. to 2 p.m.